Happy Monday friends!! What a whirlwind weekend - I'm pretty sure my feet are in a permanent state of "please don't walk anymore," but my heart is so full because I spent the weekend having an amazing time with one of my best friends! Rachel & Mike came to visit us on a whim and I'm so happy because leave it to us to figure out on this trip that we have been best friends for 10 years - that's a whole lot of laughs, inside jokes & crazy stories and this weekend was no exception! Warning...photo & food overload ahead! We started the weekend the only way I know how - with sushi at our favorite place! Gary & I joked that we're like family to the owners at this point since we're there so often and they saw it first hand with the special roll they created for us! We rarely go out on Friday's, but when in Rome (or I should say when your friends come to town) you go out - so we capped the evening off with a few drinks at Hops N' Scotch. I've given the "this is Boston" tour more than a few times already and I wanted to treat Mike and Rachel to new things for all of us, but don't worry I still snuck in all the important sights! This meant starting with a tour of Fenway Park! I've been to my fair share of Red Sox games and sat in almost every section of the park, but I've never been on the tour and I knew it would be something different for us to do! We learned about the history, sat in the most expensive seats in the park & even made our way to the press box! Of course we picked a peak weekend, but the tickets are usually $18 which is a great price for a little over an hour of touring! For as long as I've lived in Boston - I've never done this so it was nice to check this off the Boston Bucket list! I think we can all agree that it wouldn't be a visit to Boston or for that matter a visit with me, if we didn't have at least one lobster roll. I selfishly wanted to taste out a new place and took them to Luke's Lobster. Over the last few months people have been raving about the food and for good reason - top 2 lobster roll's I've had in Boston! They have a small menu - which to me means they have perfected their menu items. Seating is limited in their Back Bay location, but it was so worth the trip! Gary and I already vowed to go back! We walked everywhere - over 11.5 miles in one day and on one of the hottest days no less, but I was able to highlight all the beautiful spots! Getting a reservation on a Saturday night in the Seaport is tough...especially when you try to get one the night before, so we opted for an oldie, but goodie - Rosa Mexicano. Some of the best fish tacos & Mexican street corn I've ever had! 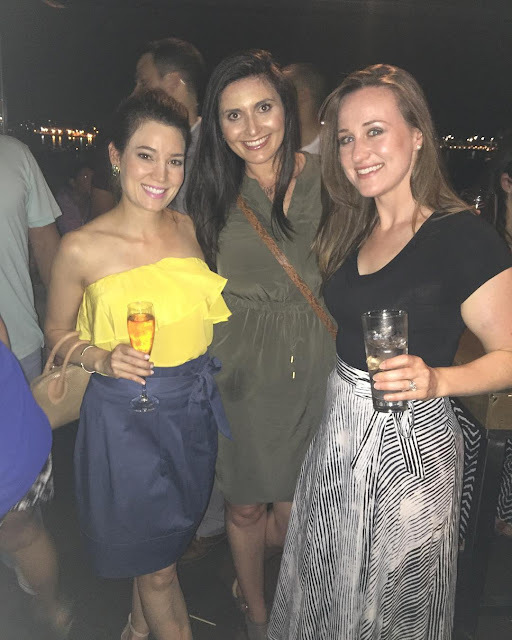 After dinner we headed over to Committee to meet up with friends, which turned into making our way to Legal Harborside, where we went a little overboard with boomerang and making fun videos! When you cover so much ground on Saturday - you have the luxury of taking it easy on the sight seeing on Sunday, so you start with brunch! I chose Masa in the South End - it's somewhere I've been a few times, but not in over 3 years and it was amazing!! My favorite compliment of the weekend was that I didn't steer anyone wrong with my restaurant choices - I might start a food tour here! There's not doubt that Rachel & Mike left the city completely satiated! We all didn't want the weekend to end, but that just means more trips are in order!! One of the best weekends this Summer! How was your weekend? Link up below to share it with us! What gracious hosts you two are showing your friends your city and such a great time!! LOVE all these pics you three gals all dressed up....so pretty....not sweat....glowing with happiness, lol!! I bet your week ahead is going to be great!! Looks like a really fun weekend! And so much delicious food! I bet Fenway park is so fun to check out!! So fun! I've never done the Fenway tour either! & that shine girl! Boy was it a toasty one this weekend! Love the photos! Happy Monday! So cool that you guys got to tour Fenway Park! I would love to do that one day! You guys had SUCH a full weekend! I hope your week is just as wonderful! What a fun weekend! Best friends (and quality time with them) is the very best!! Your food tour looks great- I'd buy a ticket! :) have a great week! Per usual, your food game looks amazing!! I wish we had somewhere that had fabulous lobster rolls in Atlanta. So jealous! I would TOTALLY hit up Biana's Food Tour if I'm ever in Boston!! Your choices always look AMAZING to me! Glad you had a great weekend with friends! Wow, what a fun weekend for sure!! All of that food has my mouth watering! I've never had a lobster roll but need to change that because I love lobster - but I know it wouldn't taste half as good here as it does there! My stomach seriously just growled viewing this post. I've never done a Fenway tour either! Next time for sure. This post is making me sad we don't have a Boston trip scheduled this Summer! Your weekends are always full of the BEST looking food! I always think it's so fun when people come to visit and you get to play tourist in your own city! That lobster roll looks so freakin' amazing! Glad you had such an awesome weekend!! How wonderful that you got to see your bestie and take her on a fun tour of Boston! I now want to eat everywhere you went! what an amazing weekend! best friend time + city exploration, you can't beat it! i love that you guys are regulars at your sushi restaurant! i need to start that trend haha. and give me all the lobster rolls. i think you could totally do a food tour and go on and on in that great city! Being touristy with friends is so much fun. Glad you had a great weekend. the sushi, the lobster roll! OMG it all looks AMAZING! Yay for friend time! I am seriously taking notes as we will be spending a day (I know! Only a day!) in Boston in August. All that food looks phenomenal! And thanks for hosting! First timer here! Oh my, all the food!!!!! I know to hit up to hang out with if I am ever in Boston!!! Sounds like you had a fabulous weekend and how exciting to do it all with your bestie! I love playing tour guide with good friends who love seeing everything in a city! Sounds like you a good one too. :) Looks like a fabulous weekend! This looks like a blast!! That is so great they got to come and visit and see all the sights--and new ones too! Nothing like some bff time!! Looks like a perfect weekend with friends! Playing tour guide in your own city is so much fun, and looks like you fit a ton of activities in! Where did you go for sushi? Your snaps looked like so much fun this weekend! I didn't know Rosa Mexicano had opened in Boston! I just knew them in NYC! That's awesome that you did the Fenway tour - it's such a cool ballpark! I hope it stays exactly the way it is! Looks like your weekend was perfection ! Love all the pictures ! There is nothing like time with old friends! Looks like you all fit in all the best stuff too. I love playing tourist in my hometown, especially when you get to show your bestie around town in the process! When we were in Boston we did the Fenway Park tour, and even though I'm not a baseball super fan, it was so awesome to learn all about the history of the oldest ball park in America! Y'all definitely had a fun weekend, and ate so well too! I swear, you always have the best food to share!! Looks amazing! I need to stop watching your snaps when I'm starving. hahaha Or just move, because I need some lobster roll in my life! How cool was your Fenway tour?! Totally something we would enjoy doing! Sounds like an awesome weekend with friends!! All your food pictures are making me hungry! Such a fun weekend of friends and sightseeing! And all that food ... Yum! All of that food looks amazing! You need to start a food tour for sure! This makes me want to visit Boston! Glad you had a great time with your friends in town, your snaps looked so fun! Have a great day. It looks like you had the best weekend and are the best tour guide! You know how to pick delicious places to eat! Looks like a really great weekend with your best friend! Wow you had so much good food! They had a Rosa Mexicano in Atlanta when I lived there and I always wanted to try it but never got the chance.. definitely looks amazing! Looks like you guys had such a great time! And how amazing was that tour of Fenway?! What an awesome experience! Happy Monday! I love being a tourist in my own town and bringing friends along for the ride. Your restaurant choices look fabulous! What a fun weekend with your bestie! So much amazing food! A Fenway tour sounds so fun too!! You make me miss my college years in Boston so much with this tour! I loved the Fenway tour and did it quite a few times! And man, I was so much skinnier when I walked everywhere in Boston! It looks like you had so much fun! $18 for an hour tour of the stadium is not bad at all and that lobster roll looks so delicious! I'm sure you were the best host/guide, you know all the spots to dine and hang! I'm glad you were able to catch up with your friend, beautiful! I hope you have the most amazing week ahead and thank so much for sharing! That lobster roll looks ah-mazing!! Some of our favorite weekends are those with friends visiting and it looks like you guys had great weather and got to do so many things! It is great to be a tourist at your own town. I am sure there is a ton about Michigan U have not explored yet. Great pictures, Biana. =) Great times, too. It looks like you had a great weekend. I love all the spots you highlighted and the food looks heavenly. That lobster roll looks amazing. You seriously eat the best food every weekend, you should start a food tour! I so like your smile! It's sincere and warm. Thank you for sharing your adventure. you definitely should start a food tour! you are seriously the best host when people visit you. as always, the food looks amazing and it looks like you all had a fabulous time. Your weekend looked incredible! Always the best with old friends :) Also loving your bag from Saturday night !! What a seriously fun weekend with your bestie! I love that the sushi place you guys love made you your own special rolls-- that's so cool & they look so pretty! You have to tell me your favorite kinds since you don't like raw fish either & I'm feeling like I might want to try some eventually, haha. The Fenway tour looks so cool- I wish we would have done that when we were there but added it to my list for next time for sure :) We have a rosa here and we went a few years ago with my mom and had the best tacos (maybe ever)- so your picture makes me want to go back! I adore your olive dress! and what a fab weekend!! Looks like you had such a fun weekend! Aww looks like such a fun time! I am just dyyyying to make it to your city!! That lobster roll has my mouth watering holy cow. I've never had one!! You guys look like you had the best time!!! So awesome they were able to visit and you had such successful tour guide weekend! Gosh that sounds like a great weekend! I wish we had a weekend full of good food and friends like that. That first sushi photo looks AMAZING! Interesting roll! Haha...don't you worry...we're sweating like crazy here in Texas so I feel ya! WOW! That lobster roll is killing me, I want it now! ;) all of this food has me drooling. What a fun weekend with your bestie!!! All of that food looks absolutely delicious! You definitely know how to 1) give a tour of Boston & 2) hit up all the good food spots. Happy Monday! That is one awesome weekend. I'm drooling just looking at all your food and bestie time is simply the best. Fun and a workout all in one, 11.5 miles in the heat, wooo!! Looks like a fabulous weekend. I'm drooling over those fish tacos! I still haven't had sushi since the baby, but your pictures make me think I need it tonight!!! Such a fun weekend with friends! So much fun!!! I absolutely love showing people around my city since there are so many awesome spots to show. It must have been great to see your friends especially ones you've been friends with for such a long time! Your weekend looks so fun, so much walking! That helps offset all the eating! Bestie time is seriously the best especially when you have a fun city to ecplore like Boston. Good to know about the tour of Fenway Park. My husband definitely wants to go to a ballgame when we finally make it there together but learning the history and such would be fun too! One cannot visit Boston and not have a Lobsta roll! Ok, unless you have a seafood allergy but that's definitely a must on my list. Sounds like you really enjoyed your weekend, the food looks so delicious. 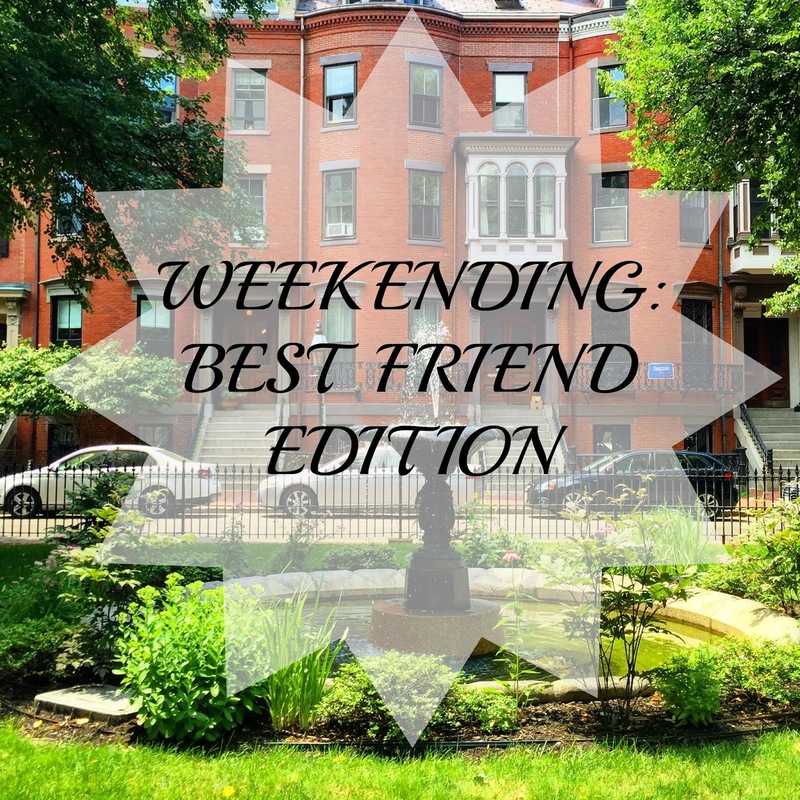 Your weekend roundups always make me feel like I need to get out more! And if you don't mind sending me a lobster roll, I'd appreciate it, thanks! I really love that olive dress! I'm obsessed with that color lately. And it's so fun to play tourist in your own town. What a fun weekend, that olive dress is great on you! The tour sounds like something I would love..and at a good price too! Your own sushi roll...LOVE that! This sounds like the best weekend with quality girl time! Touring the park looks so fun and it's so affordable, this is going on my list! Looks like a ton of fun. This post made me really hungry all of a sudden, haha! You are such a great tour guide! I loved watching all of your snaps, you guys had a blast! Seriously, the lobster roll....made me so hungry and it's almost midnight! LOL! And your olive dress is beautiful and olive suits you very well! It looks like a super fun weekend! I love that cute white tank with the sequins on it!! Yum that lobster roll looks amazing!! And that's so much fun that y'all have all been friends for so long! Reminiscing over old stories must be such a laugh! Looks like you had a fun weekend! That lobster roll looks amazing! Looks like a lot of fun! Those photos are amazing! I love the food ones! What a fun weekend! The last lobster roll I had was at MVY - so good! There's nothing like being touristy in your own city - I love doing it because you discover so much. That sushi looks INCREDIBLE by the way. Nothing like spending time with your bestie! Looks like you guys had a blast!